After a good breakfast, everyone arrived at the pickup point near the hotel on time at 9.30am. 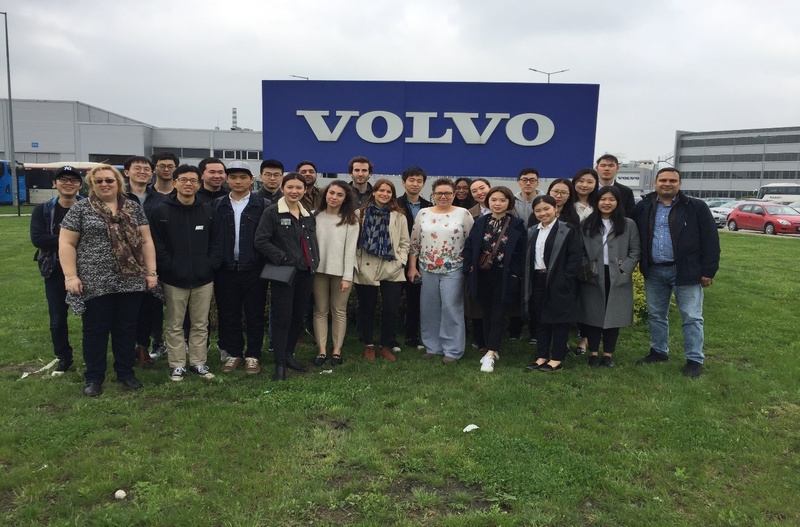 All of us were very excited as we were going to the Volvo bus manufacturing center. It was a time to learn most of the things which we have studied. We arrived at the centre at 10:30am. The Wroclaw factory is Volvo’s largest European plant for manufacturing buses. We had a detailed explanation about the diesel, electric and hybrid technology in transportation and a presentation of general strategies for planning in the regions. We also enjoyed a tour of the plant, specifically of the bus production line where we also saw how to use Just-In-Time and Kanban strategies. We were told the cycle time is four hours for each bus and in 15 days one bus is ready to be on the road. They also use 3,000 different kinds of components for buses. We also learned about the challenges of the hybrid technology, for a greener and more efficient regional transportation. After the Volvo plant tour, we came back to the hotel for lunch and at 2.30pm a guide was ready to take us for the walking city tour with the boat excursion. Our guide told us about the history of the city and explained that this city is more than 1,000 years old. Our tour guide explained that in the 1980s, a student named Waldemar Fydrych started an anti-communist movement by disguising himself as a dwarf, and it was a very successful movement. From 2005, the city government placed a dwarf in the city which people liked and now there are more than 350 dwarfs spread over the city. They are now very famous visitor attractions and we also found a few of them. We were all in love at the first sight with the main railway station which was few steps away from our hotel. This railway station is the oldest railway station in Poland which was built in 1855. This city also called “Venice of Poland” and “The City of Bridges” as there are five rivers passing through the city and more than 130 bridges in the city. Wroclaw is also called “The City of Churches” because there are many churches and one area is called “Cathedral Island”. Wroclaw has a lot of history, it was partially destroyed in world war II. Nowadays, we can see a lot old and new buildings in the city. We had a boat excursion as well which was one hour and 30 minutes long. That was also an amazing experience to see the city from the river. At the end of the tour, we arrived at the city center which is very beautiful. We had a long walk today and all of us are again very tired. Let’s see what tomorrow will bring for us!